I liked the return to a traditional pantomime with a witty script by Jim Sperinck interspersed with some well known, modern songs. The sets and costumes at Young Expressions always show good attention to detail and this year’s production was no exception. What was different was the use of midi or backing tracks rather than a live band, which was handled extremely well from both technical and artistic standpoints. If there was a conductor I didn’t spot him and so great reliance was placed upon the performers to follow the music, which they did very well. Less successful, in my view, was the use of microphones, which appeared to work only sporadically and left some singers somewhat overwhelmed by the backing track. Placing of mikes just below the hairline or attached to the side of the face usually works best since this avoids picking up the rustling of clothes and reduces the risk of movement during costume changes. However, this may work less well if mikes are being shared. Cinderella had a strong voice with or without amplification and was also an extremely good actress. Buttons too was confident in her vocal delivery and was very engaging. 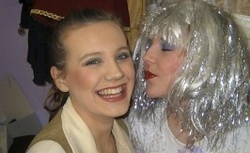 The ugly sisters worked extremely well together and managed to bring out all the fun of such excellent roles. Short, Back and Sides added to the comedy as did Baroness Boracic-Lint, with her OTT performance. The Fairy Godmother had a strong voice and was a good foil for Penny Peace, while Prince Charming and Dandini, although a little quiet, looked suitably dashing. There were so many individual and group roles that most of the cast must have been quite busy changing costume for their next scene. There was no evidence of haste on stage since scene changes were efficient and all characters were prompt and on cue. This is good evidence of a well-rehearsed production.